If the success of KwaZulu-Natal’s North Coast is ever chronicled, it would be quite a remarkable story. We would be taken on a journey characterised by transformation, success and unwavering development. The seedlings of the region’s development began as far back as 1851 when the sugar cane industry began to boom. It is these plantations that remained the identity of the town for over a century, and helped grow its domestic economy. It was also around this time that the roads between Johannesburg and the North Coast was established, which represented a new chapter for the region as it gradually transformed into a popular tourist destination. As the decades passed, the North Coast built a world-class holiday industry that eventually replaced its sugar cane plantations, and became the leading contributor towards its domestic economy. Further along the timeline, about a decade into the 2000’s, we saw the region enter a new chapter of development where the residential market slowly started to take hold. Today, the North Coast can be described as an amalgamation of holiday homes and luxury residential estates and apartments that overlook turquoise beaches and are effortlessly supported by a network of premium amenities. The region is currently emerging as a competitive player in the South African real estate industry. And for many industry experts, it is considered the leading destination for estate homes for home buyers around South Africa, and even internationally. The North Coast has transformed into a luxury residential metropolis due to strong developer and investor interest in the region, which is fueled by its close proximity to the Dube TradePort (home to the King Shaka International Airport). 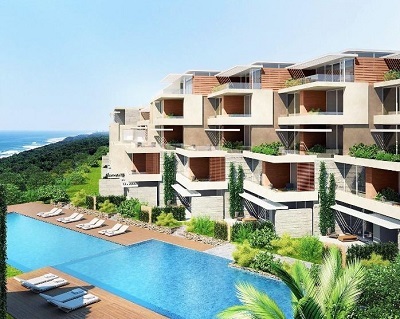 This has resulted in the burgeoning of game-changing developments such as Zimbali, and the mammoth, Sibaya Coastal Precinct. As estates and apartments become more widespread in the region, the requirements of modern home buyers are slanting towards the lifestyle and amenities offered by these homes. The very blueprint of the Sibaya Coastal Precinct has intrinsically catered to these requirements, which include unparalleled security, unsurpassed luxury and a unique lifestyle. Homes here exist amid state-of-the-art security measures that allow residents to feel safe and protected at all times. The parameters of the entire precinct are secured by full height electric fencing, smart surveillance, intelligent security systems and biometric access control. These measures blend seamlessly with the design of each residential development. For those who seek the finer things in life, it doesn't get any better than the Sibaya Coastal Precinct. Homes exude contemporary and stylish finishes that are infused with elegant interiors. For example: OceanDune, which is the first residential development to be constructed in the precinct, is designed with upmarket finishes. It incorporates natural products such as bamboo, stone and off-shutter concrete into the façade design. The layout of OceanDune allows woodland areas to flow freely into the courtyard spaces, creating a harmonious correlation between nature and development. Sibaya’s residential developments host a mix of private and common amenities that promote a certain type of lifestyle. All residents will have access to blue flag beaches, retail hubs, restaurants, schools and hospitals. While private facilities differ from each development. For example: The Gold Coast Estate, which is poised as the largest development in the precinct, promotes an active and healthy lifestyle as it features a tennis and squash court, outdoor play area, an aerobics studio and gym, and jogging and cycling paths. The Sibaya Coastal Precinct will undoubtedly represent an important milestone in the development of the North Coast. Upon its completion in 15 to 20 years, the precinct will significantly expand the residential market, and the region will yet again undergo a new transformation.